The ASP.NET MVC Report Designer is a web reporting tool used to create and edit simple to complex RDL reports. The web-based Report Designer makes it easy to integrate an intuitive run-time RDL report editing and customization into your web application. The ASP.NET MVC Report Designer is a web reporting tool used to create and edit simple to complex RDL reports. The web-based Report Designer makes it easy to integrate an intuitive run-time RDL report editing and customization into your web application. It lets you create reports with reporting features such as parameters, expressions, sorting, grouping, filtering, report linking, hyperlink, and more. You can preview and export the report to PDF, Excel, CSV, WORD, PowerPoint, and HTML formats. Explore your data from any of the local or server data bases. Create an embedded or shared data source by connecting to the most common data sources by using the following data providers. Built-in data sources-Microsoft SQL Server, SQL CE, Oracle, XML, OLEDB, and ODBC. Custom data processing extension–ODATA, SASS, WebApi, MySQL, SQLite, PostgreSQL, etc. Data query preparation can take most of your time, but with Report Designer, data query generation can be done with a few clicks. Query builder provides a convenient user interface that helps both technical and nontechnical users to create and view relationships between tables. Basic Items—Text box, image, line, and rectangle. Data Region Items—Grid and pivot table. 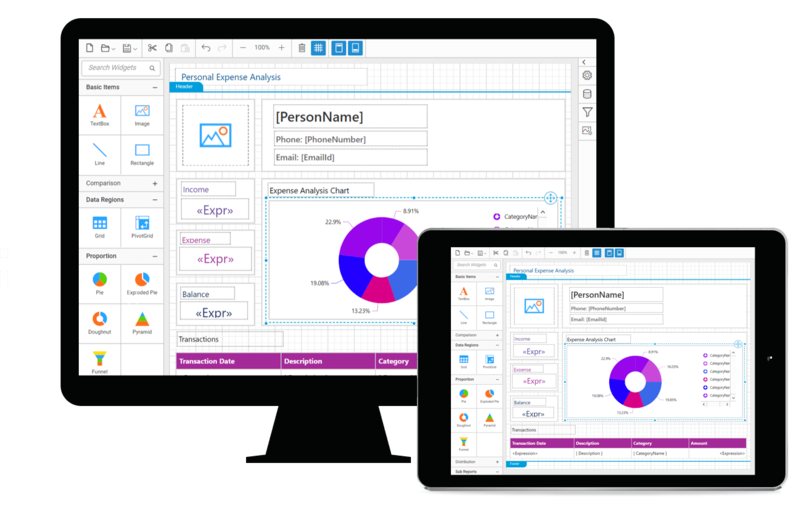 Provides rich user-friendly interface to easily transform your data into beautiful reports, using the configuration options such as property panel, data configuration panel and image manager. Supports creating report parameters manually or based on a data set query. Parameters are used to interactively provide user inputs at run-time to vary report presentation based on it. Parameters can also be used in expressions to control report data. Allows users to create a report with SQL RDL reporting’s extremely powerful interactive features like drill through and hyperlink to display data and information in detail. Report Designer provides an expression builder that allows you to create simple and complex RDL expressions. Expressions are used throughout the report definition to vary the content or appearance of a report. The ASP.NET MVC Report Designer provides an option to preview the report and verify whether the created report displays what you require. Run or preview a report, and export it to popular file formats such as PDF, Word, Excel, CSV, PowerPoint, and HTML. The ASP.NET MVC Report Designer allows you to save a report to Syncfusion Report Server or SSRS Report Server and to your computer. Publishing a report to the server allows other users (who have permission to access the server) to view it.